This is my second unit in 8 years. I use this deraileur for long distance touring and is perfect for my needs. Merlin prices are ausually very good. 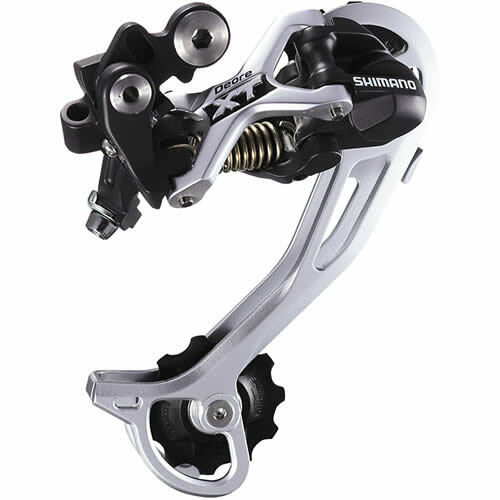 Reliable smooth shifting MTB derailleur. Competitive price. Great piece of hardware! Nicely designed. This 9 speed derailleur can be used with a 10 speed shimano drivetrain...perfect for touring applications. Smooth as silk. Excellent price for a reliable shift. Bought this as an upgrade to the stock part that came with my bike. Night & day difference! I have XT on my other bikes, and am a big fan of durability & performance. I moved to the high mountains of Colorado and needed lower gearing on my Dura-Ace equipped Trek OCLV to handle the steep grades and 9,000 to 12,000 feet elevations. So I installed an 11-34 cassette and XT M 772 rear derailleur. The combo works flawlessly with my Dura Ace shifters. Thanks to the crew from Merlin. The derailleur came to US in a timely manner. Shipped the next day after placing an order. The derailleur works flawless with the rest of Shimano 9 speed drive train. This will surely serve my bike well for the next several years to come. Using on a 2008 Specialized Roubaix road bike with Ultegra compact front & 10-spd shifters, 11/34 XT 10-spd rear cassette, on new WT-6800 rear wheel. Works well; reasonably fast shifts. Occasionally mis-shifts, but it may be due to new gear needing get used to each other. Excellent service, quick delivery, best prices hands down. I love their site and their gear. Recently swapped out my stock rear mech and this is much much much better. Super snappy and smooth. Really happy. The front is next. Also...goes really well with new xt shifters. 10 days to arrive to TX, but this model isn't available in the U.S. and glad to retrofit and older bike. Very nice upgrade from a 2005 XT RD on my Canondale with a SRAM 9 speed cassette and shifter. Very crisp shifting and reduced chain slap. Have these derailleurs on most of my rides, no problems and great shifting, Shimano quality ! I had to switch 2 of my bikes from low-normal to top-normal derailleurs because of new bike with 10 speed. These derailleur are easy to install and tune. They perform very good so far. The shadow design definitely runs quieter than the traditional style XT derailleur I was using. Shifting is crisp and smooth. No complaints here. Sooooo smooth and quiet. Having a great transmission set makes the ride so enjoyable. Definitely the best prices out there, great service and very fast delivery to California. I was in two minds whether to go for this, the SLX or more Deore. I use my bike to travel to work most days in all weather and wanted something built to last. I have it teamed with SLX shifters and a XT Front Mech. One of the most important parts of your bike is the shifting and these deliver in bucket loads. The SLX range is still well worth a look but if you can push that little bit further go for these. Great product, perfect shifting. Excellent sevice and fast delivery.Thanks! Fantastic rear derailleur. Flawless shifting even under heavy load, and looks nice! Paired with XT shifters, its awesome! If you're going 9 speed, this is it! Good and reliable, smooth gear change every time. I only ever buy shimano XT or SLX. This product is excellent. I ran 1 bike at mountain mayhem (2012) the mud was epic, my shifting remained crisp throughout 24 hrs of riding. AS USUAL, MERLIN SAVED THE DAY WITH THIS NEW REAR MECH, I'M ON MY BIKE AGAIN.